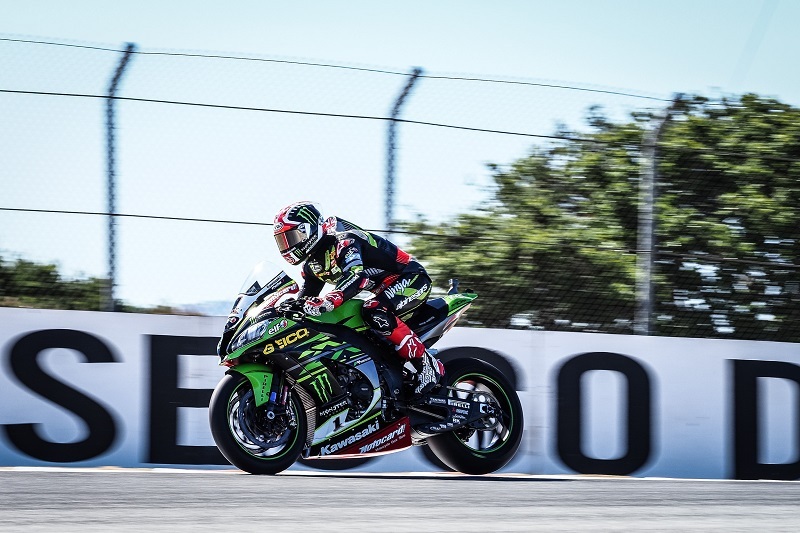 Jonathan Rea (Kawasaki Racing Team WorldSBK) topped the timesheets in each session at the WeatherTech Raceway Laguna Seca, as his consistent pace put him in control, despite a crash in the middle of free practice three halting his performance in the afternoon. With three action packed sessions out on track, fans are prepared for a stunning day two in California. There was a sense of familiarity in FP3, as Marco Melandri (Aruba.it Racing – Ducati) and Tom Sykes (Kawasaki Racing Team WorldSBK) accompanied Rea in the top three, as they did in FP2. The Italian was the only one of the trio to improve his best lap time, however it was not enough to trouble Rea’s mark. A trend in recent final Friday practice sessions has seen Lorenzo Savadori (Milwaukee Aprilia) creep up the timesheets as the day goes by. Today was no different as the Italian, who was fourteenth in FP1, smashed his earlier times with the fourth fastest lap of the day. This also placed him above his teammate Eugene Laverty (Milwaukee Aprilia) for the first time on Friday, with the Irish rider in fifth position. Chaz Davies (Aruba.it Racing – Ducati) secured the sixth fastest time of the combined results, jumping ahead of Brno race two winner Alex Lowes (Pata Yamaha Official WorldSBK Team), in seventh. Eighth went to Leon Camier (Red Bull Honda World Superbike Team), who found his way into tomorrow’s Superpole 2 in the final session, as did the Spanish duo of Jordi Torres (MV Agusta Reparto Corse) and Xavi Fores (Barni Racing Team), with both men back up to pace in ninth and tenth respectively, after struggling in the past two rounds. The shock absence from the top 10 at the end of Friday was Michael van der Mark (Pata Yamaha Official WorldSBK Team), who couldn’t improve his best FP1 lap throughout the rest of the day, and will have to start from Saturday’s Superpole 1. The Dutchman ended up with the eleventh fastest time of Friday. As for the home riders, Jake Gagne (Red Bull Honda World Superbike Team) took 14th on Friday, with wildcard Josh Herrin (Attack Performance Two Wheel Legal Yamaha) in 15th, and PJ Jacobsen (TripleM Honda World Superbike Team) in 18th. The GEICO US Round has gotten off to a wild start! And things will heat up even further tomorrow with Superpole 1, live from Laguna Seca starting at 11:00 local time (18:00 GMT).